The historic landscape area of Henllys comprises the extent of the former Manor of Henllys. The area defines the extent of land holdings primarily associated with Old and New Henllys and includes intake/enclosed former moor along western fringe in addition to earlier enclosed core lands. Occupation of the area dates back to the prehistoric period attested to by finds of the period, including scrapers, a flake and retouched flake. Little is known of the early history of the area; the place name Henllys may reflect to importance of the area as a place of some importance prior to the arrival of the Normans in Gower, and may refer to the existence of a native Welsh 'maerdref' settlement. Following the Norman annexation of the area it became a Mesne Manor. The Chantry or free chapel of Henllys in Llanddewi (05291w; 01457w; 11802) was surveyed in 1545 and 1547 by commissioners appointed by Henry VIII; of this no surviving remains are known (Evans 2003a, 2004). The only surviving features known of the medieval period in the area is a deserted rural Settlement (00154w; 15430) comprising hut and croft of medieval date. During the post-medieval period the area, along with most other parts of Gower, underwent major changes to its agricultural landscape and tenure patterns. 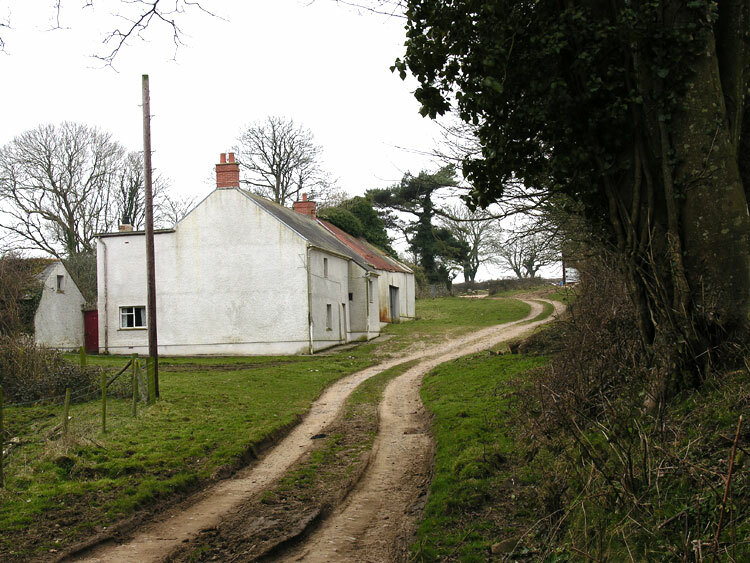 The Mansel family emerged as the main landowner within the area, the largest of the Gower landowners. Whilst remnants of the former medieval system of open field are traceable in the landscape as fossilized quillets or landshares within the field pattern, the current enclosed landscape relates largely to the consolidation of holdings initiated during the sixteenth century. Henllys was a manor held by Henry Mansell in 1583. Rice Merrick records that Henry Mansell bought the manor, which had formerly been the inheritance of the Barrett family, from Erasmus Saunders. Following financial problems in 1715 the Manor of Henllys was transferred from Captain Edward Mansel to his kinsman Thomas First Baron Mansel of Margam, becoming part of the Margam and later Penrice Estate. The demesne of Henllys was reorganised as a result in the early eighteenth century: this entailed the division of the extensive holding originally farmed from Henllys into smaller holdings, including the farm of New Henllys. As a result the manor house of Henllys, was renamed Old Henllys. The house of Henllys and its associated farm of over 200 acres (81 hectares) continued in Mansell ownership until sold to tenants in the 1960s. The house of Old Henllys (01634w; 19501) has a characteristic vernacular Gower plan with lateral outshuts. The central unit of the house is a hall of sixteenth century date, of hearth-passage type with gable-entry stone stairs with cross-slab roof, bed cupboard, later additions, and partly thatched. The hall unit was probably built against an earlier or contemporary west block, subsequently demolished. The existing west extension is undateable, but very substantial: it has at some period been converted to domestic accommodation, as there is an internal door to the older part on each floor. A large chimney (traditionally called the Flemish chimney, but not a large example by Pembrokeshire standards) projects centrally on the gable end. A smaller east extension is of eighteenth and twentieth century date. Barrel vaulted cellars of brick located to the west are thought to have originated as a rainwater reservoir for the house (Morris 1998, 107-117; Listed building description). The extant farmstead of New Henllys, a moderately large Renaissance style house with central stair passage flanked by kitchen and parlour and gable end chimneys has a slightly offset symmetrical façade typical of the period, is depicted on a Penrice estate map of 1786 with a range of outbuildings attached to its northern end. New Henllys is thought to have been constructed during the mid-18th century, under the tenancy of the Hancornes, rather than under the single life lease of Marry Harris, which began in the 1720s. Whilst the Hancornes leased New Henllys from 1731, the house was sub-let to various tenants; first Hoskin(s), possibly father and son, and from 1830 to the Hugh(es) family until sometime during the 20th century (Morris 1998, 39-42). The first edition OS 25-inch map and earlier estate maps show that the field system remained largely unchanged from the 18th century, with only minor amalgamation of some of the smaller enclosures or strip fields taking place during the latter part of the 20th century. Areas of enclosed rough grazing, particularly to the south and west of Old Henllys appears to indicate areas of former waste or unenclosed common, this is to an extent confirmed by place name evidence such as Lower Old Moor (now in ruins and renamed Kingshall) and Higher Old Moor. These and the former outlying farmstead of Kingshall (ruined by the publication of the 1st edition OS map) were connected to Old Henllys by Kingshall Lane; this, a green lane/drove route running between Llanddewi via Old Henllys and the western common of Rhossili Down. The settlement of Henllys is depicted as a linear range of buildings set within a linear yard within a matrix of varied enclosures, small outbuildings extend to a pond to the east, while the farmyard comprises three ranges of outbuildings located at a slight distance to the west with sawpit and disused quarries adjacent to the south. Just east of the settlement a wide route of rough grazing extends south below the Kingshall Lane, beyond a circular pond, to an irregular enclosure of rough grazing, possibly a remnant of former common. To the northeast of Old Henllys is New Henllys, located more convenient for the minor lane to Burry Green and shown as a farmstead with attached L-shaped range to the north, with freestanding outbuilding opposite forming a three-sided yard. Gardens/vegetable plots are located to the south of the house. A further separate building is located nearby to the west, whilst further northwest is a pond. Also depicted on the 1st edition OS are the small farmstead of Lower Pitlands (now Betlands), a T-shaped arrangement of two separate ranges, and an unnamed cottage to the north on the roadside verge of the minor lane to Burry Green (probably a landless agricultural worker's dwelling).